Abstract: Necrotizing autoimmune myopathy is characterized by predominant muscle fiber necrosis and regeneration with little or no inflammation. We describe a 58-year-old woman with previous breast cancer and statin use who complained of rapidly progressive weakness of lower limbs without pain, making walking, running and climbing stairs difficult. The creatine kinase level was 2,843 U/L, and muscle biopsy showed a dystrophic pattern. The genetic test for muscular dystrophies was negative and for anti-3-hydroxy-3-methylglutaryl coenzyme A reductase was positive. Intravenous immunoglobulin was administered, which showed mild improvement. Unfortunately, she took a step and collapsed to the floor, which led to the fracture of right femur delaying her improvement. 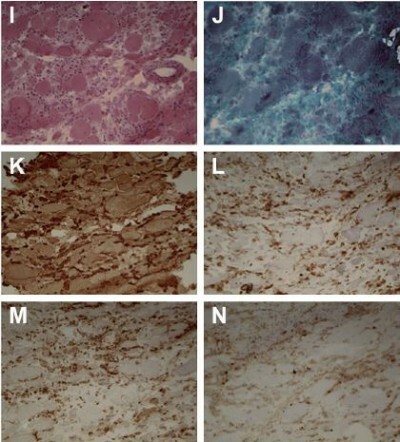 The diagnosis of necrotizing autoimmune myopathy is sometimes delayed due to the atypical pathologic findings on muscle biopsy. As the disease is a severe condition, prompt recognition can lead to a successful outcome. We advise to consider this entity as a differential diagnosis among muscular dystrophies.